They Had This Hunch . . .
isters Sharon Holman and Claire Powell of Sonora and Eldorado, Texas, aren't the 'l told you so' types, but if they were, they'd be saying it frequently these days. Call it a woman's intuition, a hunch or whatever, but when they saw Boer goats for the first time they had a feeling this was an animal that had a lot to offer the U.S. meat goat industry. "We took some major ribbing when we first went into this (Boer goat business)," said Claire. Claire and Sharon grew up on a very traditional Edwards County goat ranch, the daughters of Mr. and Mrs. Charles Ray Pfluger. "Now all those ranchers that were kidding us about it three years ago are wanting to buy goats from us. Now, it's 'make me a good deal,'" Claire laughed. She said the worst thing that happened to the Boer goat was its arrival to the U.S. on the heels of the ostrich and emu. Some people lumped Boer goats into the "get rich quick" category. Although their husbands, Jimmy Holman and Johnny Powell have been supportive all along, Sharon describes them as "cautiously optimistic" in those first months. "But now they're very much behind us," she said. At the time of our visit, Sharon and Claire were preparing for their third production sale. "You can tell by the barn he (Johnny) built for the goats that he is behind us," said Claire. And Sharon's husband, Jimmy, a traditional rancher by nature, is also very supportive and involved, but the women are fully responsible for their Boer operation. Claire and Sharon became interested in Boers in 1994. Because of their lifelong involvement in ranching, the women have acquired more knowledge in raising livestock than your typical goat producer these days. Their Boer business was intended as a diversification to their family ranching operations. It was in 1994 when they bought a nanny from a New Zealand Boer operation. The nanny was bred and had two kids. That was their start. fter the initial investment the partners decided to reinvest their profit from their first year into I goats imported directly from South Africa. The desire to pursue quality instead and forfeit pocketing their profits has lead to a herd of goats anyone would be proud to own. "Reading about these animals and seeing they were an improvement over this country's existing genetics is what convinced us of their importance in the beginning," said Claire. "This isn't an exotic, this isn't something that's going to be here today and gone tomorrow. It is a genetic improvement of a meat goat that is doing wonders for our typical Spanish goat herds. This is just another way to diversify - another avenue we can approach." As the Boer goat has evolved into a viable industry, the top quality animals now bring a premium and the lessor animals can be purchased for much less, Claire observed. he sisters have maintained from the beginning of their Boer operation that they are not in the business to be commercial breeders. "From the beginning we have wanted to breed and be able to offer some of the best breeding animals we can raise and sell them to purebred Boer breeders and commercial goat breeders in the area," said Claire. "We're basing our operation on conformation of the animals and good performance - one doesn't work without the other. Our Iong-term goal is not to get in and make money and get out. Our goal is to be here with these goats from now on. We really didn't know we'd like these animals as much as we do. After we bought them and started raising them, we just fell in love with them." Sharon's husband, Jimmy (an avid Angora goat producer) also believes Boers have a significant place in the U.S. ranching industry. However, he urged mohair producers not to allow hair from Boer-Angora crosses to become mixed up with mohair going to the warehouse. "I hope nobody that crosses Boers on Angoras tries to take that hair to any warehouse," said Jimmy. "It doesn't deserve to be shorn and it needs to stay away from mohair." He thinks the positives of Boers will be a great benefit to Texas ranching as a diversification. "One thing these goats will do to wilder Spanish herds is the offspring will be much gentler than just a straight Spanish goat. They're going to add a lot of bone, a lot of meat and there is definitely a place for them in the United States." Sharon said her observation of Boers has been that the animals have many subtle differences from more typical Texas goat breeds. t the ranch, Powell-Holman Boers are not kept in concentrated numbers in small lots. They are kept in pastures and allowed to roam and browse at will. However, when the pastures become less than lush from drought or during winter months, the goats are given supplemental feed, just like the traditional livestock. It is important to Sharon and Claire that their goats know how to find food on their own. "The commercial breeder can become very frustrated when their Boer buck has no idea how to find something to eat in the pasture. The kids learn from their mothers where to find food," said Claire. "If feed is always in the trough then the baby has no idea what natural browse is or where to find it. Sometimes the learning process can be very painful for both the goat and his owner." They have developed management practices somewhat through trial and' error. Since most of their kids are a result of embryo transfer, there are short periods of very intensive kidding. Goats are kidded in a barn-pen setup, Sharon explained. When the kid is born in the pen, it is moved with its mother into a barn and placed in al small pen for two or three days to make certain the mother is claiming the kid. Kids are tagged and vaccinated before being turned out into a large pen with shelter. When kids are about one week old, the doe and kids are turned out into a small trap of about 10 acres. Oak trees provide natural shelter and goats have access to a three-sided shed. "These goats mature much earlier than other breeds we've been around," said Sharon, "and many people want to begin breeding their does before they are a year old. We have learned the hard way this is not a good idea. There is a reason ranchers don't breed their heifers, ewes or Angora goats before one year. It is simply too hard on them and you stand a good chance of loosing her during the birthing process. If you simply must have a kid right away, buy an older doe, not a baby." Sharon and Claire's father, Charles Ray, taught them that if they will take good care of their animals, no matter what type, the animals will perform at their maximum level and profits will result. More than once their father said: "If you aren't going to do it right, don't do it at all." pparently they must be doing something right, if their recent show results are any indication. Sharon and Claire started showing their goats at the first American Boer Goat Association show and continued showing in the winter show season of 1996 with entries at the Fort Worth, San Antonio and San Angelo shows. They also participated in the second national show in Tyler, Texas, and in the Odessa show in early-fall 1996. 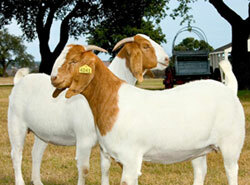 They have had goats on the Angelo State University meat goat test in 1996 and 1997. Grand champion buck and grand champion doe, San Angelo Stock Show, March 1997. Sharon and Claire quickly agree, however, that basking in the glow of a major show win is short-lived. "You can enjoy it for about two minutes," Sharon said, "then you start getting ready for the next one." Their ability to overcome the ribbing and to forge ahead, one step at a time has allowed the Powell-Holman goat operation to thrive. It's a safe bet they're in the goat business for the long haul.